This year, the summer in Holland was warm and long, and the Indian summer was sunlit and abundant. But the sunny days are over, and the winter is creeping in. So, it's time to make our plates a bit brighter. Tomato confit can remind you of sun-dried tomatoes, except it's not dry at all. It's juicy, soft, and luxurious. It's good with pasta, gorgeous on your breakfast spread, and beautiful both with hummus and a big ball of mozzarella. It tastes like summer in a jar! And what more than you need this time of year? One of the best things about this tomato confit also happens to be one of the best things about slow cooking. By the time the food is done, you can't even remember you had to do anything. Wikipedia says that confit is "any type of food that is cooked slowly over a long period of time as a method of preservation." I say, tomato confit is the thing from your happiest dreams. Warm up the oven to 120° Celsius. 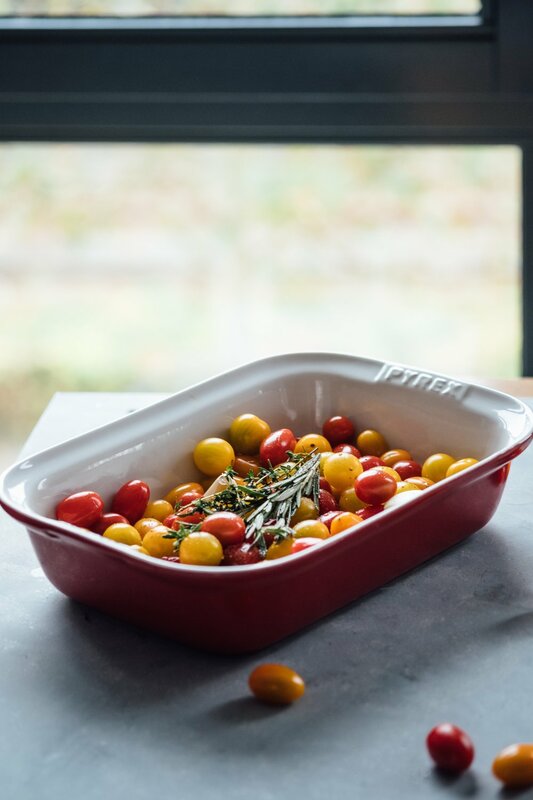 Wash the cherry tomatoes and put them, without cutting, in a baking dish. Add garlic cloves, rosemary, and thyme. You can use dried herbs instead but remember they taste more potent than fresh. I prefer the latter because I can tuck them in jars of confit afterward and let their aromas intertwine even more. You may use more garlic to taste, but don't allow yourself to use none at all. It gives your confit a significant punch and a tender, yet persistent contrast to the sweetness of the tomatoes. Pour olive oil, so the cherry tomatoes at least halfway submerged. Sprinkle, generously, with salt and pepper. Put in the oven and let cook for 2-3 hours. I usually check it around 2,5. Tomato skins should be wrinkly, but they should be perfectly juicy inside when you bite in. Let the confit cool and transfer to jars, and pour the olive oil from your baking dish over it. Olive oil will carry a lot of flavors, and also act as a natural preservative, preventing your confit from oxidation. Enjoy, be surprised how quickly you've eaten it, and make some more.